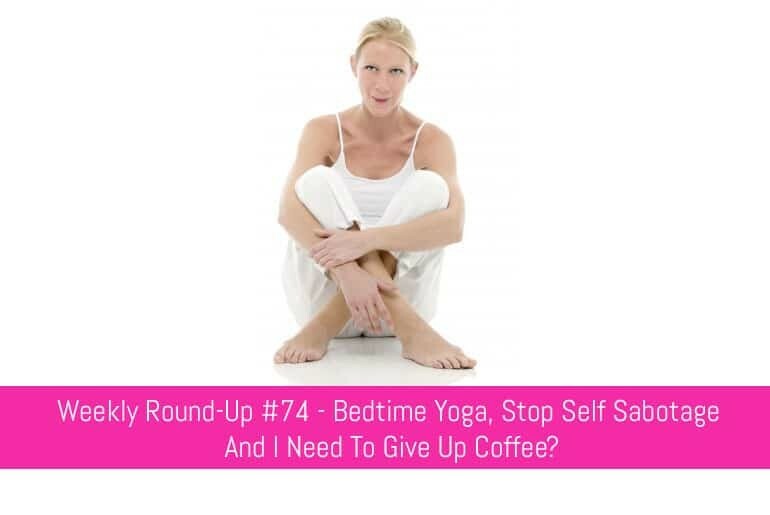 Weekly Round-Up #74: Bedtime Yoga, Stop Self Sabotage and I Need To Give Up Coffee? Welcome to this week’s round-up. If you’re new here you may have missed the great guest post on Storage Hacks for your home and office – check it out if you’re struggling for space or don’t know what to do with all that “stuff” that seems to accumulate – and if you’re not sure where to start when decluttering, read my review of Marie Kondo’s “The Life Changing Magic Of Tidying Up”. Also last week I released the free monthly printables for June so you may have missed a free Harry Potter Happy Planner/A5 Dashboard/Cover, June Weekly dated calendar and June Monthly Dated Calendar and some Motivational Wallpaper – phew! That’s a lot of downloads!. Make sure you sign up to the newsletter for more great freebies. Anyway, on to my round-up of this week’s top productivity and life hacks! 3 Simple but Effective Ways to Stop Sabotaging Yourself – Inc.
I’ve written about the dangers of self-sabotage before and if you’re wondering why things don’t go your way, why you should even bother trying anything, or why things never seemingly go “right” for you then please check out my article and the Inc. article. More often than not you’ll be doing something that’s avoidable but your inner-monologue tries to make it into a self-fulfilling prophecy. I keep on going on about yoga but have yet to settle down and try it. The reason? I don’t have the fancy yoga pants or mats, or the time. According to this Lifehack article though I don’t need any of those things in order to relax and have a good night’s sleep. I’m lucky enough to have a bed big enough for these exercises (king,baby, yeah!) but if I need to do them on a floor I’ll be hard pressed to find the space – more investigation needed I think unless one of my lovely readers can advise? If you don’t get point number one then there’s no help for you… okay maybe that’s harsh but I always find cleaning my bathroom makes me feel slightly better about myself. Maybe it’s because I’m finally admitting I’m an adult and have these sorts of responsibilities, maybe it’s because I’m happy the toilet isn’t in the same state it was in my student days! The only thing that puts me off this article is getting up 10 minutes early… really guys! I try not to put two articles from the same author/publication in the same round-up but this article had been lingering around for a while and there was something bothering me about its contents that I couldn’t figure out until tonight. Nowhere in this article is about seeing the issue from the other person’s point of view, or being empathetic to the other persons’ needs. So I don’t need to sympathise but I do need to cut down on my coffee? As much as I like my caffeine I think the priorities are wrong there. If you’re a user of Evernote or Google Drive then maybe this is an interesting read for you. Evernote seems to be becoming more powerful with each update to the software and with integration to Google Drive it may overcome some of the limitations in terms of storage the free Evernote subscription places on you. Yet another article that states early rising is a game changer. I reckon if this were true and I could get my rear-end out of bed I’d be a billionaire by now! Ignoring that there are a few other interesting items in the article that may provide food for thought – I especially like the “get lots of sleep” bit! You may initially confuse the 3-item to-do list with the idea of “3 Most Important Tasks” but they are a bit different. With your “3 Most Important Tasks” you write down everything you need to do and highlight the 3 most important items. With the “3 Item To-Do List* you literally write down the 3 things you want to achieve that day and that’s it, nothing else comes in to the picture. I guess if you’re working on larger style projects then limiting it to 3 items makes sense, if all you have on your to-do list is bits and pieces and you can accomplish quite a few then there’s no sense in the “3 limit” I guess it’s more of a judgement call rather than a hard and fast rule. I don’t think I need to say too much about this article except for the fact it advocates sleep, extra sleep naps and an equivalent of the continents siesta! Don’t place what others think of you in too high a priority, don’t feel that you’re less than everyone else and failures don’t necessarily mean failing. This is a really interesting article if you’re in a job that doesn’t necessarily have a set career path. I think point number one of “being responsible” would be something that any person looking to forward their career would think to be an intrinsic part of their job description but there’s some interesting ideas here around making yourself invaluable and influencing your colleagues which may prove beneficial.